We do not have the Tormaster cart anymore, but it is a great machine. We now use a Brent 1500 on steerable rubber. 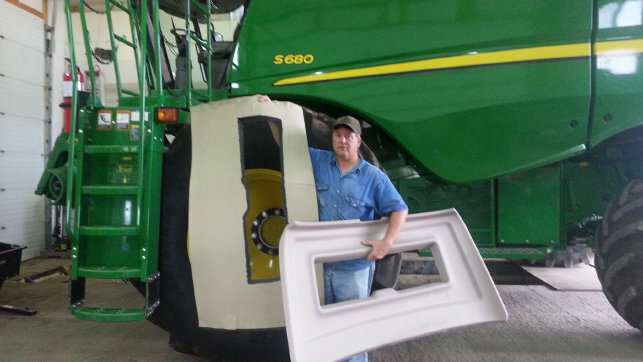 David's fix for a noisy First Generation S680 combine cab. Get some noise absorbing foam from your local sound absorbing foam guy. (We have one in town. True) Cut to fit and install against the tin back of the cab. He lowered the noise level 7-8 db's. Removal of the black plastic air flow directors seems to let more air out of the combine. We installed some puck board to keep debris from going up into the engine compartment. 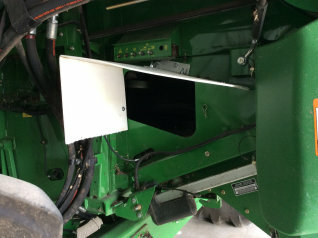 Our machine has the power tailboard which seems to impede air flow out the rear of the combine.